We are giving away 10 sets of MARVEL’S SPIDER-MAN HOMECOMING movie pack on our INSTAGRAM (@ShawTheatres) account! Step 1: FOLLOW @ShawTheatres on Instagram to qualify. 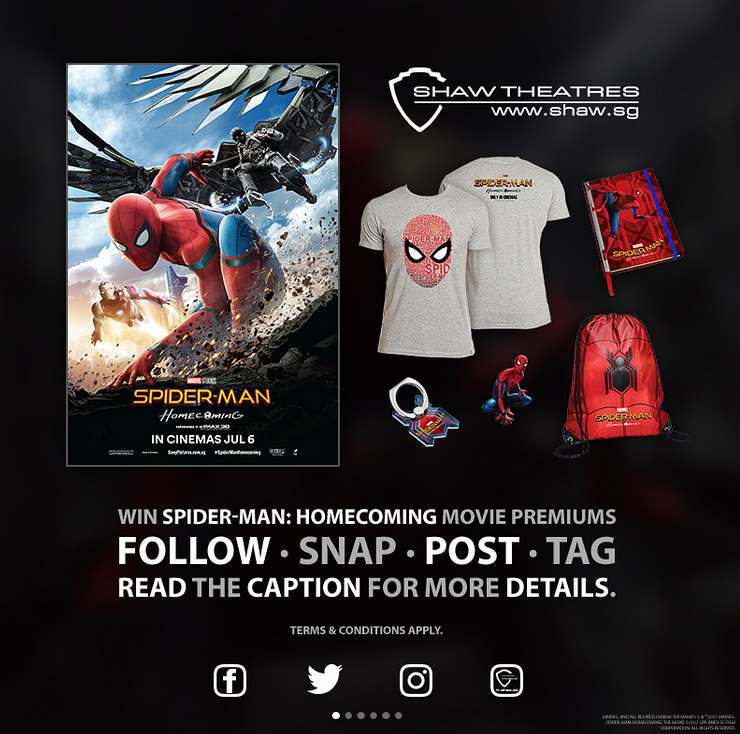 Step 2: Take a picture with any SPIDER-MAN HOMECOMING display/posters at SHAW THEATRES and post it to Instagram. Step 3: Give a caption to tell us what you love about the movie! All images used are for illustrative purposes only. Contest ends Wednesday, 19 Jul 2017. Winners will be announced here so do check back for it. Winners must be residing in Singapore. Judges’ decision are final and no further correspondence will be entertained. Find out more at Shaw Theatres.